It's hard to believe that Fall is not far off. Especially when the temperature gauge is still reading in the 90's. Still, there is a hint of fall in the brisk morning air. 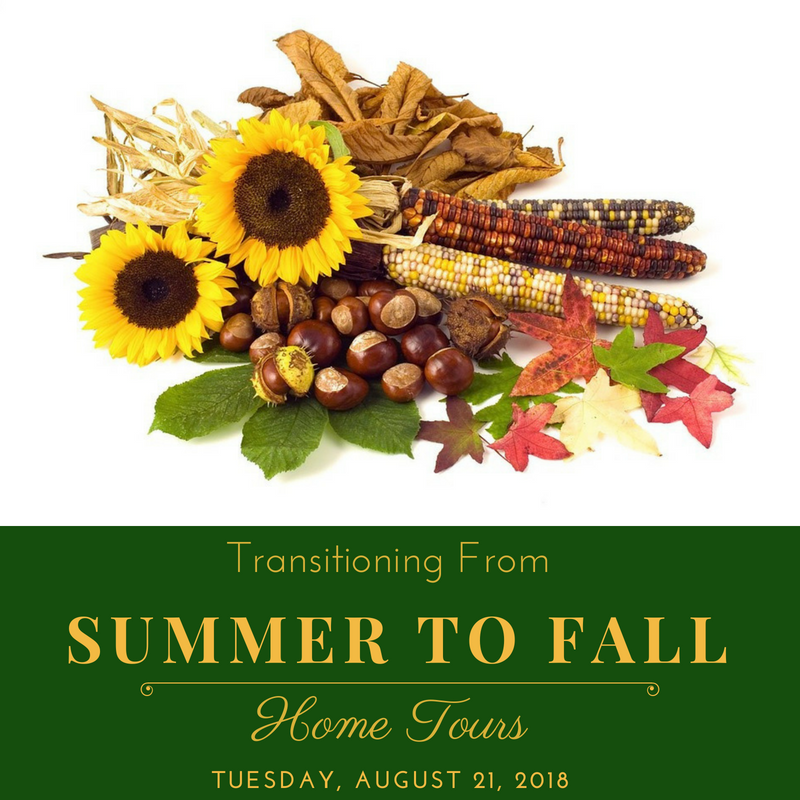 Thanks to Amber from Follow the Yellow Brick Home a fun group of bloggers have come together to show you how we have began transitioning from summer into fall. If you are coming over from visiting Carol at Art and Sand I know that you have already received lots of inspiration! I have alot of fall décor that I love pulling out each year. However, it's still just a tad too early for me to bring out all of my pumpkins. But it's not to early to start adding fall touches here and there. I have a few floral tin trays that highlight the flowers of summer, but at the same time embrace the colors of fall. I've placed them on our family room mantle and added a few of my favorite things. I love this wooden shoe form. I found it at our local thrift store. I had never seen one with the addition of leather, and I love the number! I have three cast iron basket door stops. They are one of my favorite collections. This one screamed fall to me. I placed it on a stack of vintage books. I found a package of wooden beads in my craft room, so I strung them on a strand of jute. These two small trays were a thrift find as well. 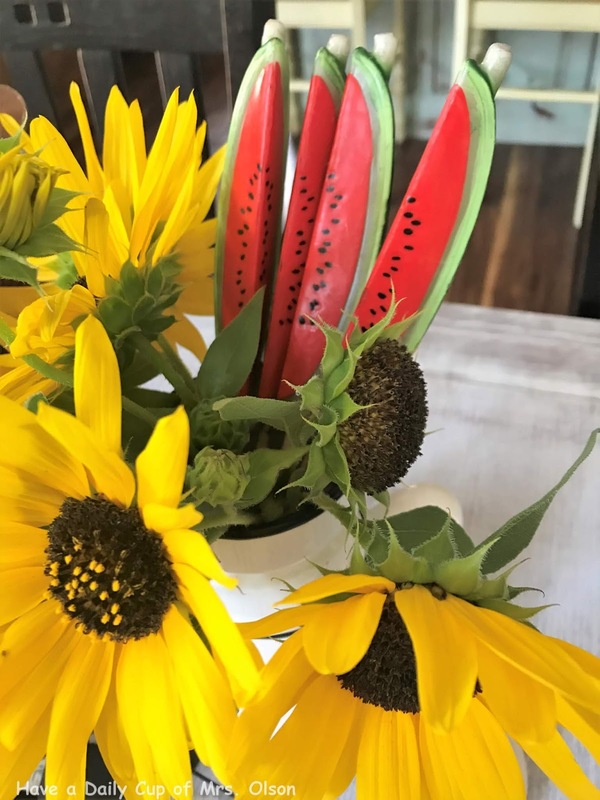 Our kitchen table is decorated in a watermelon theme for summer. 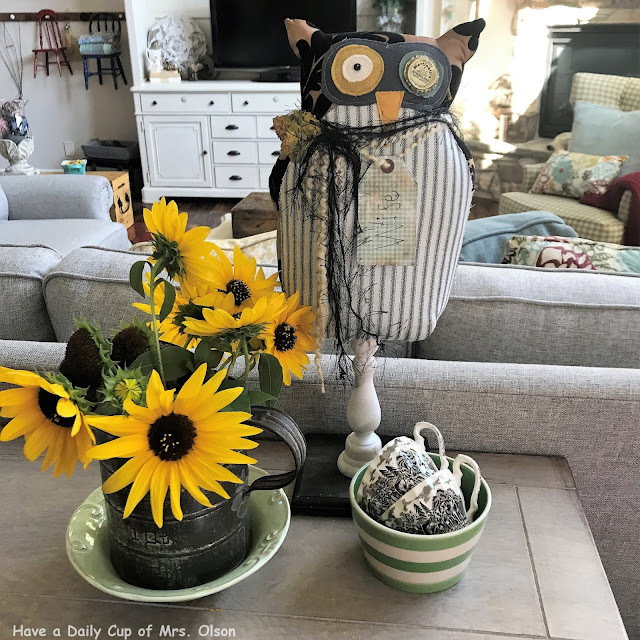 The addition of sunflowers adds a touch of fall. The enamel coffee pot made in Belgium was a recent thrift find in Oregon. I adore it's unique shape! Who doesn't love a fall picnic? I bought this cute watermelon toting girl off of Instagram last year. I had to have her when I saw that her name was June. That was my dear mothers name. I think sunflowers that have lost their petals are still wonderful, don't you? I love the warmth of tarnished silver for fall. 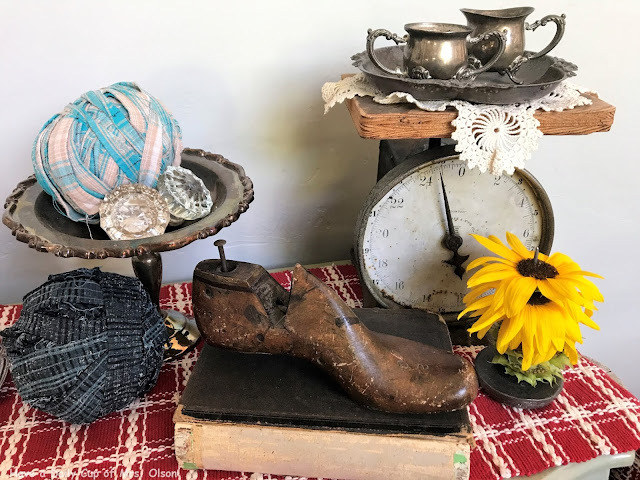 vintage glass door knobs, rag balls, old books, and another shoe form are a gathering of things that make me happy. Sunflower heads are added to an old metal note holder I picked up at an estate sale. I was digging through my boxes of fall looking for my faux sunflowers, (which I never did find) and ran across this small burlap pumpkin and berry garland. They were gifted to me last year by a dear blog friend. I pulled them out along with a few pieces of brown transferware. This chippy red mailbox was another treasure I brought home from Oregon. I found it at a consignment shop. Pretty yellow sunflowers are from Trader Joes. The bronze ones in the watering can are also from my friend Amanda's garden. I've just started adding fall touches in the entry. 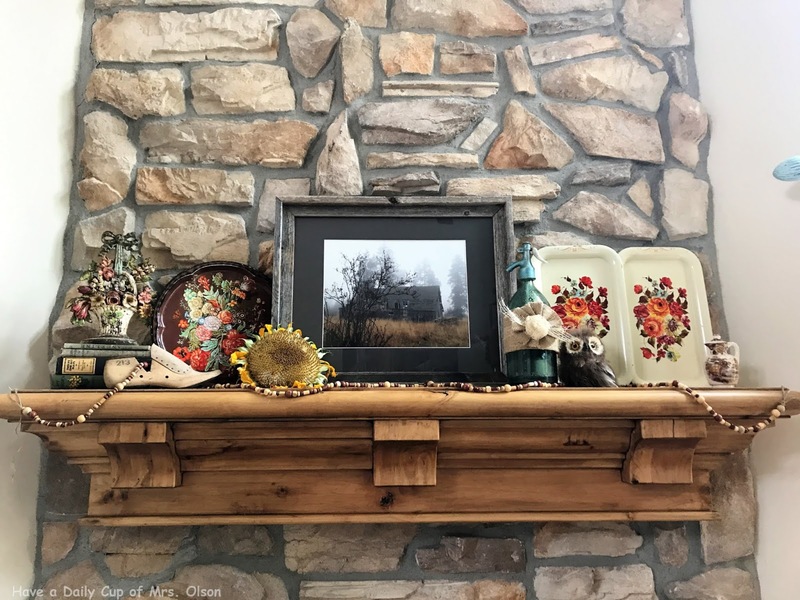 My living room mantle was decorated in a bee theme for summer. 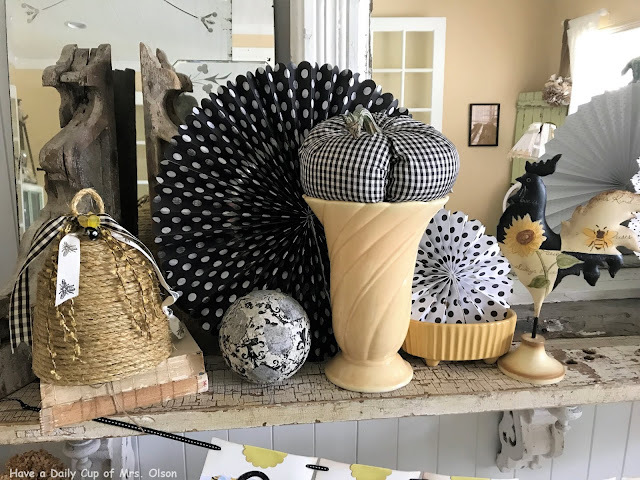 I thought it would be fun to add a few fall b&w items that I had. A checkered pumpkin and a rooster. The rooster was just perfect with both the sunflower and the bee. Sometimes we need to look no further than our own backyards for fall inspiration. 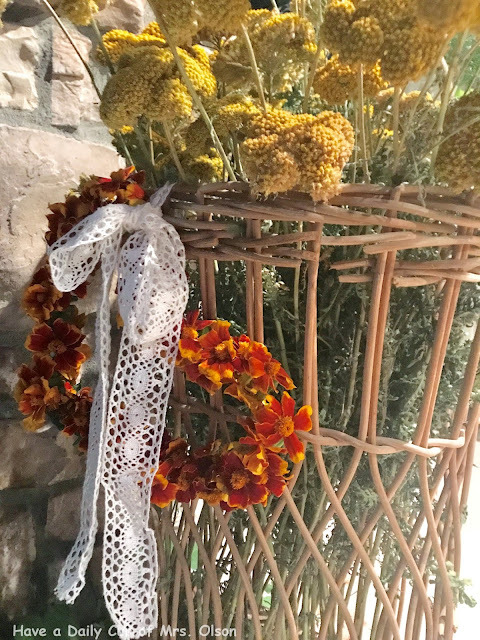 I filled a wicker rolling cart with Yarrow and created a heart wreath with wire and Marigolds. I hung it on the cart with a bit of lace. I bought the cart at a yard sale in St. George, UT last May. The man was asking $2, but I gave him $5. He told me that his 90 something year old mother used it to walk 1/2 mile every day to get groceries until she recently passed away. That story was priceless! Plus, he threw in two old burlap feed sacks. I hope that you have enjoyed seeing my small touches of fall. Soon I'll be pulling out the woolen plaid blankets and many more pumpkins. 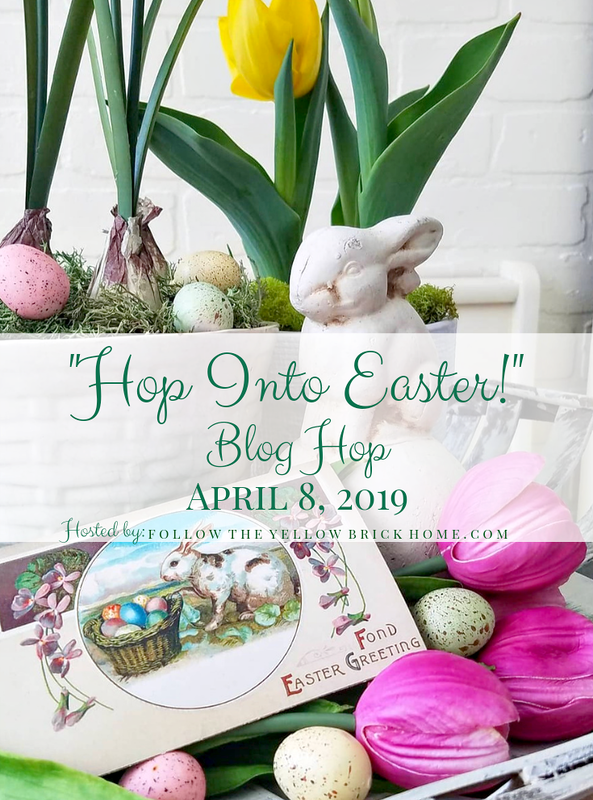 Now hop on over to Linda's at Itsy Bits and Pieces to see what fabulous ideas she has to share. There's lots more to be shared by these other creative ladies! You are sure to be inspired! You come up with the cutest ideas. The mantel looks so cute. Love the use of the shoe form, enamel trays and the beads. 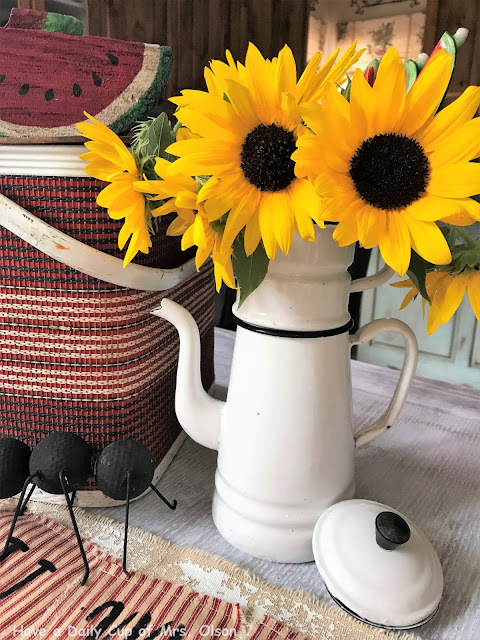 Sunflowers are the perfect flower for this transitional time of year! It's still too hot here to really think about Fall - but - as you say, there is a new coolness to the early mornings and late evenings which is very welcome. The stores seem to have exploded overnight with Fall displays for Cdn. Thanksgiving (which is in October) and Halloween so I'm starting to "look". I'd like a nice centrepiece arrangement for my dining table and I wouldn't mind a nice plaid throw for something new on the sofa so I will keep my eyes open. Love seeing all your beautiful collectibles. 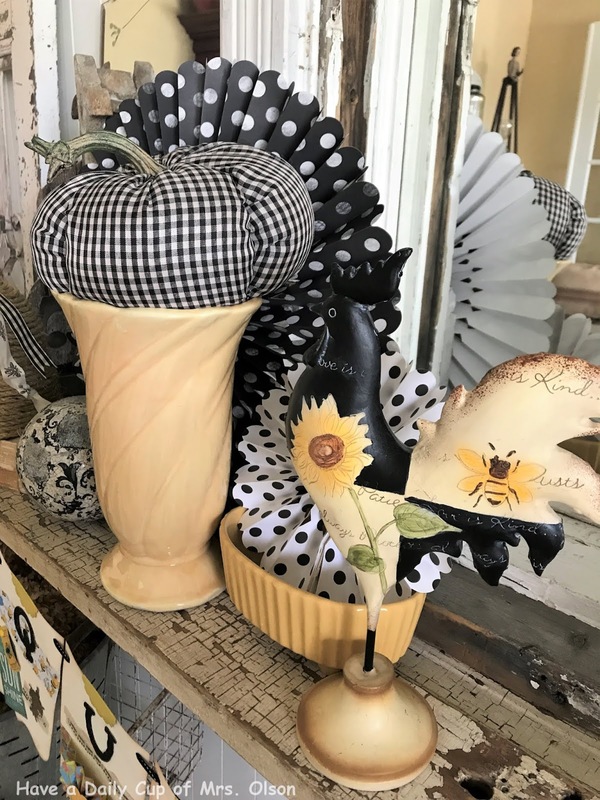 Love all your beautiful fall touches,Jann, I am so ready for fall, and have started adding a few touches here and there in my home. Thanks ofr sharing. Jann your fall tour truly delights my heart. That sweet owl sure made me smile. Did you make it? Your decor is lovely, Jann! The sunflowers are so perfect against the deeper color tones...so pretty for early fall! Jann, beautiful as always and I completely agree, sunflowers are beautiful when they lose their petals. The place I used to find them many years ago is sadly gone. 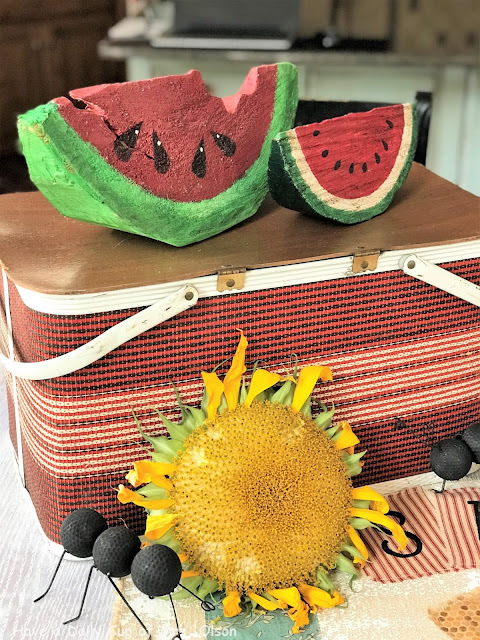 Sunflowers and watermelon couldn't be more perfect for Fall and your little Rag doll totally stole my heart. Gorgeous tour. I love each and every one of your vignettes. The whimsy makes me smile. Lovely post. Very cute, wonderful vignettes! You reminded me I have two wreaths in the garage that are perfect for late summer. I must dig them out! I wish I had sunflowers to decorate with, I don't....but I do have a lovely vase of black eyed susans mixed with fronds from ornamental grasses, thanks to my sweetie, on my dining room table - it feels perfect for this time of year! 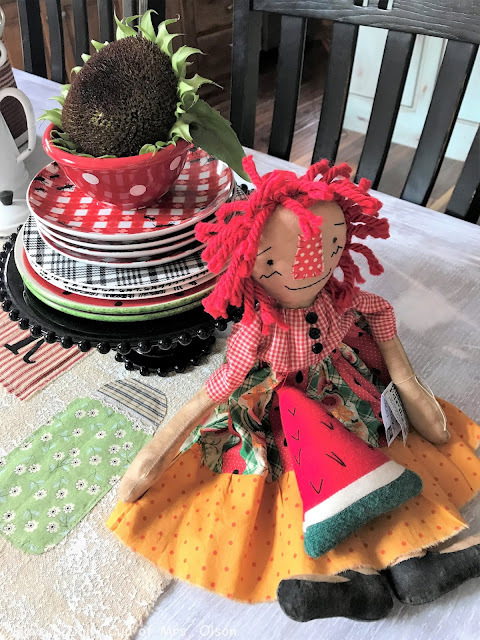 Sunflower Sue is just adorable, and ready to welcome fall, isn't she? 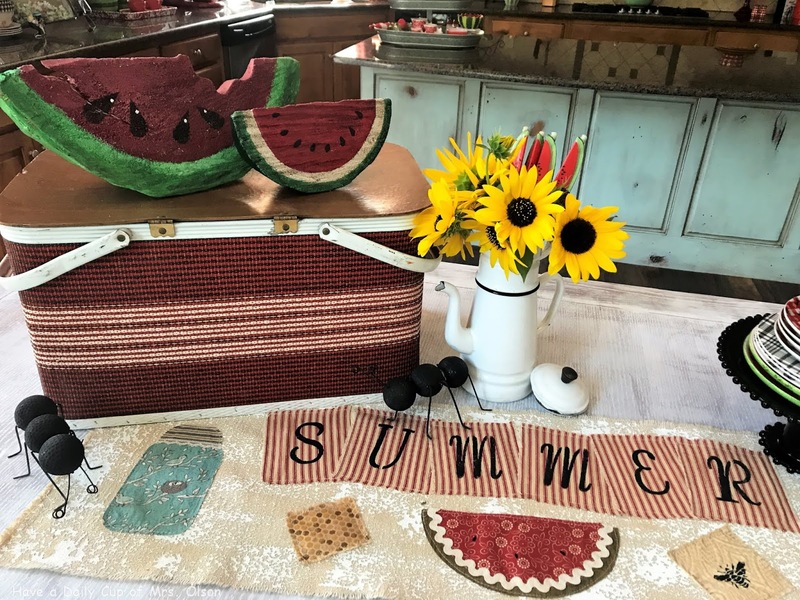 The trays with the floral displays are perfect nods to the upcoming season, along with that cute mailbox! Happy Fall! Love your mix of watermelon and sunflowers.... a perfect blend of seasons! 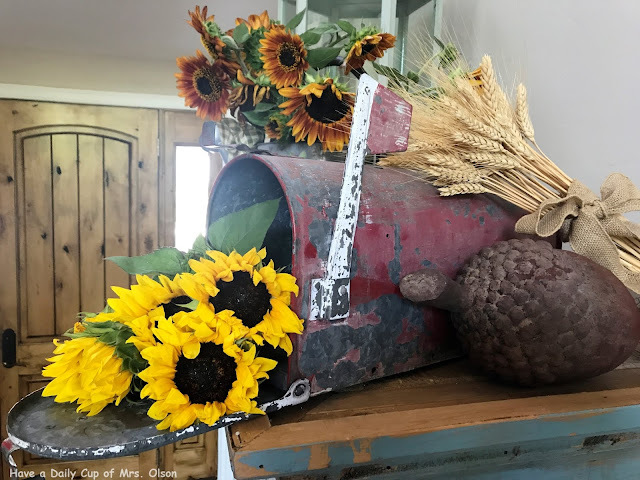 My favorite vignette is the chippy red mailbox stuffed with sunflowers! 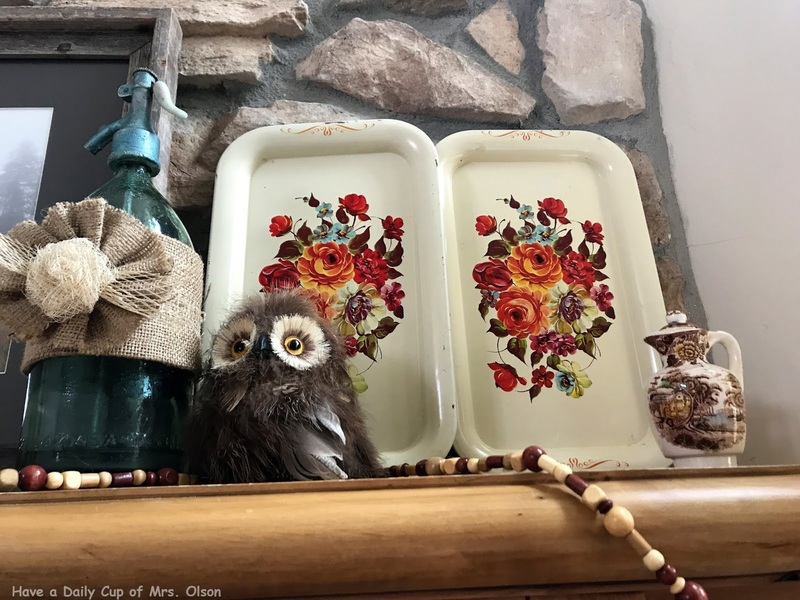 Jann, your fall vignettes are all so pretty. I especially love your mantel. It is gorgeous, and I am swooning over the round tole tray! It has been so much fun to be on this tour with you! Thanks for the super cute ideas for Fall. I've been enjoying catching up on some of my favorite blogs and seeing all the Autumn colors and ideas. Love your owl and had to add it to my pins. I just might have to get out to the barn and start making one of my own. So Cute! 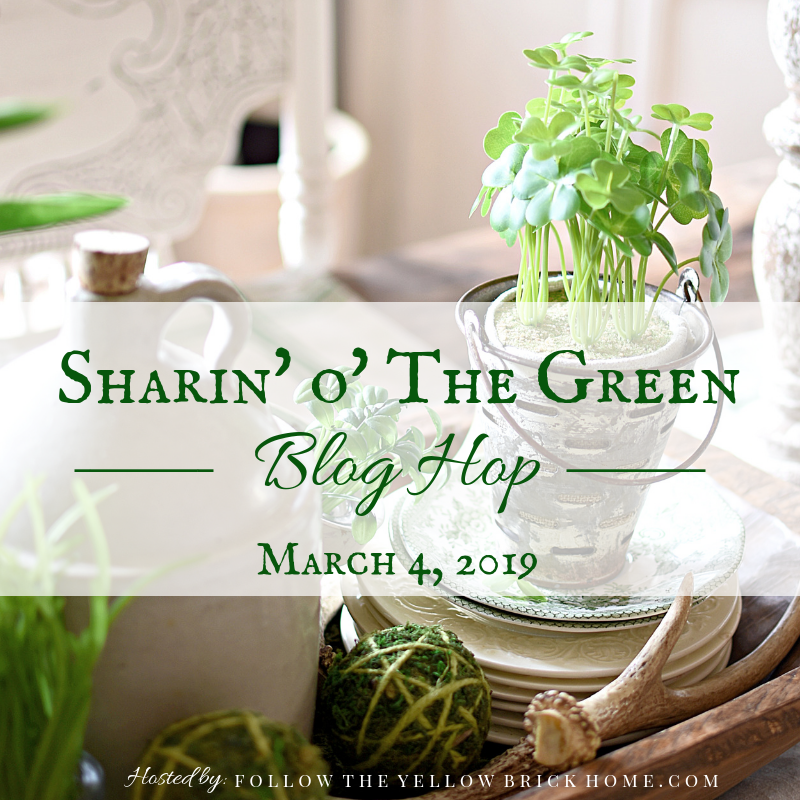 Now on to look at some of these other blogs and soak up some more inspiration. Have a happy week, sweet friend. Your transitions into fall are just adorable. Oh my I love the red mailbox you scored. That is so cool. I can see the for Christmas decor too. Love love love that owl where did you get him? How fun and whimsy he is. Love that you have a lot of color in your fall vignettes. Super cute. Love your vintage collection and vignettes. Perfect for fall! Jann, the deep rich colors of fall look so pretty mingled in with your summer goodies. Love it all! Loving all the pictures and yes, bring on Fall. Girl, with our temps being so high it has been so hard to think about Fall. I am trying to transition a little too but oh my! I break out in a sweat going back and forth to my little She-Shed. Hugs and blessings to you dear Jann. Hi Jann!Beautiful vignettes!That brown tray with flowers caught my eye,just stunning!Hugs,dear lady! What a great friend to give you the sunflower blossom. It is so pretty everyplace you put it. There is more than one favorite arrangement in your transitioning to fall tour. Of course, the sunflowers, but also the brown and white grouping with the chippy white architectural detail is a favorite. Then there is the fantastic black and white mantel with the bee hive. Just gorgeous. Jann, I love how adding the sunflowers really do turn summer into fall. I love sunflowers and hope to add my own soon! I always love seeing your vignettes, Jann. 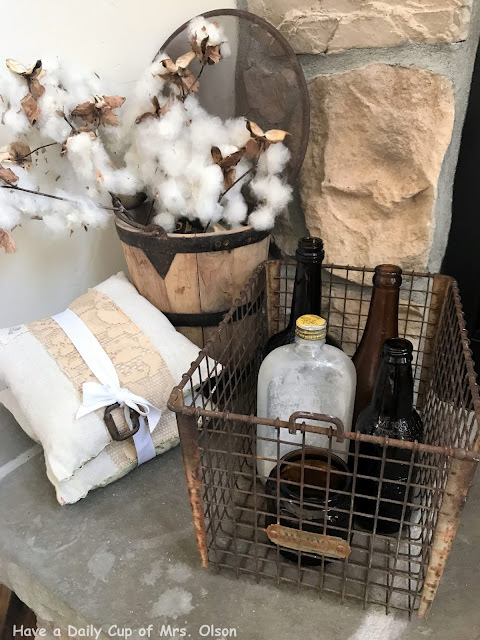 The iron basket doorstop is wonderful. I have a few, but have never seen one that is actually shaped like a basket with handle. And I have that same brown floral tray. I have a little obsession with trays. LOVE the colors and flowers you've used. I imagine you'll be starting to get some cool days soon. It's hard to get in the mood for Fall when it's 90 degrees outside. 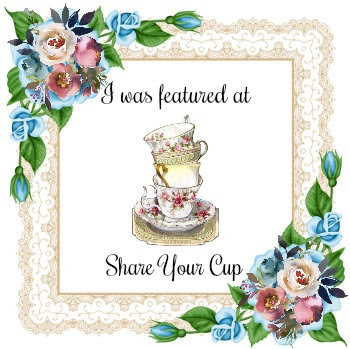 You have so many wonderful vintage things! Oh my gosh you are way ahead of the game! I love, love all your decorations and honestly I don't have many fall Decorations and certainly don't have your creative touch. I usually just wait till October to start pulling out my Halloween stuff, then I skip November haha and go right into Christmas. I wish I had your kind of vision and can see how to put things together and know what to use. Hopefully by seeing your tasteful way of decorating It will rub off on me. Everything is wonderful, but my favorites are the dried sunflowers (I hope mine looks as cool) and that great shoe insert. It is really cool. Oooooh, I'd love to shop your house! So many neat, wonderful things assembled into wonderful vignettes! I'm just so not ready for fall, Jann! But this is lovely. I'll have to revisit when I get ready to decorate! You have such terrific accessories! Hi Jann, your house is to cute! 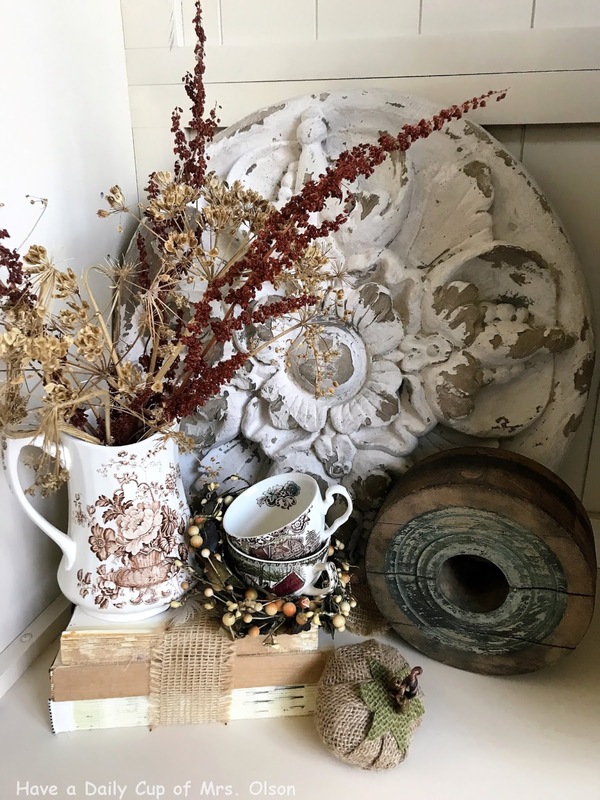 It's a wonderful inspiration for me today because I am tearing my Fall decor apart and making something new. Love, love love it my creative friend! I'm coveting your rusty mailbox and locker basket, Jann! And I totally crush on brown bottles this time of year, too! So fun to get a tour of your early fall vignettes! 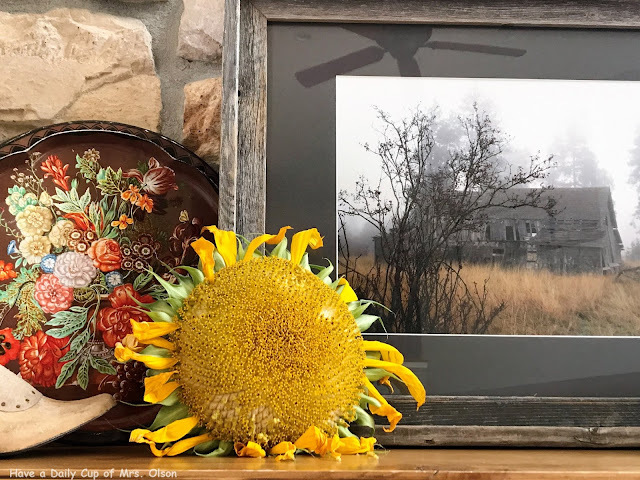 I love the giant dried sunflower, Jann! Your summer into fall vignettes are perfect. It is 57 degrees here in Colorado today! Definitely feeling the change in weather. 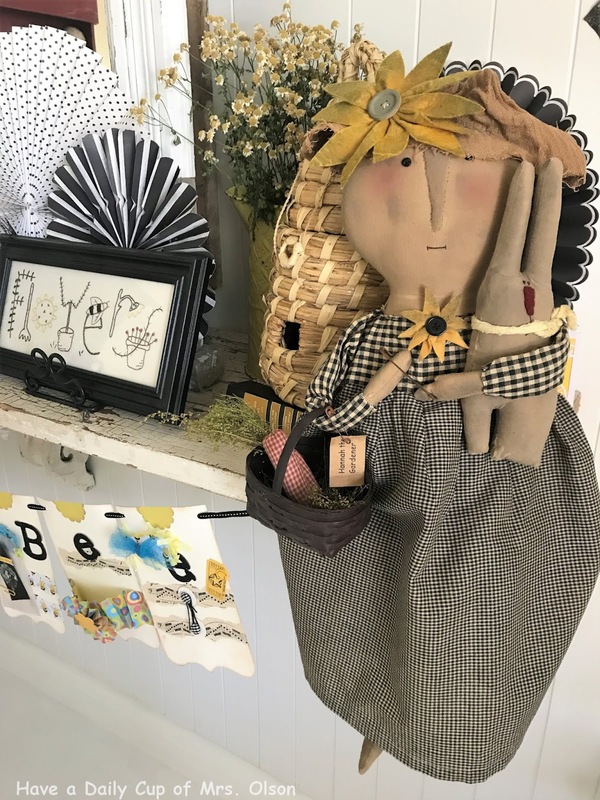 I love the raggedy dolls and prims you use in your decor! beautiful! Today we are in the 60's. Jann, it's fun to see your new finds. Too hot here for me to bring out the pumpkins and most anything fallish. I'm using late summer flowers to add some touches here. Patriotic things are packed away. You are an amazing decorator Jann. I wonder how do you keep your decorations organized? 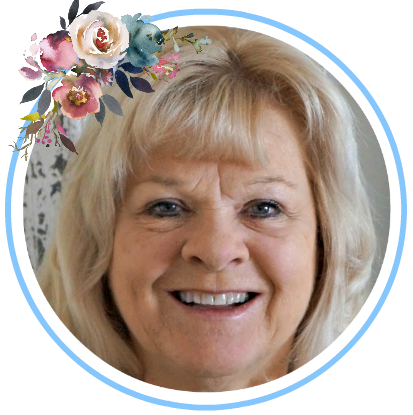 Wow, Jann, your personal inventory compares to a small craft store! Your lead photo of the left side of your mantel is my favorite. 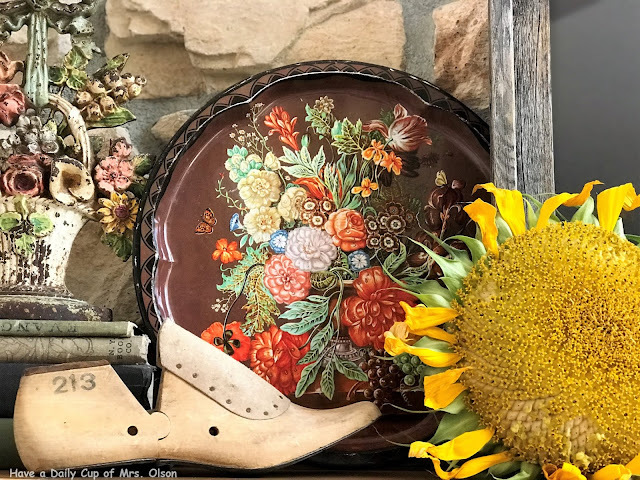 I just love the colors in that tray next to the doorstop, the wooden shoe last and sunflower. It's perfect. The yellow yarrow and field items you picked, and the cotton - all are glorious transitions of the season. Love the story of the man's mother and the cart, how sweet. Jann, I agree with Rita, your first photo is stunning. The colors of the tray and the doorstop are beautiful. Sunflowers are always happy and brighten interiors! I enjoyed visiting your perfect transitions! Your tour is delightful...and, I think I like sunflowers best without all the petals. Your home is so lovely and cozy! I collect tole trays and you had me at that!! I love all of your subtle fall touches. Don't you just love the season! Jann, your home tour is simply amazing! 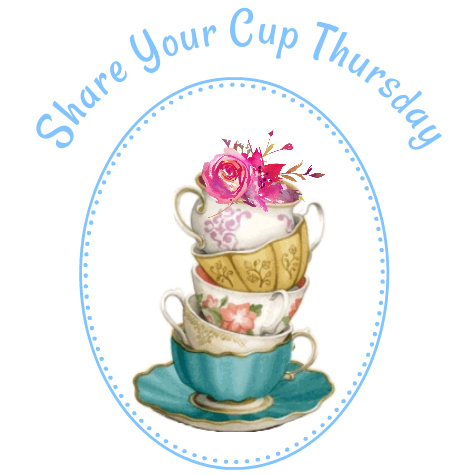 I love your pretty vignettes and how some are more late summer themed and some hint at the coming fall. So happy to be on the home tours with you! I love all of your vintage fall vignettes! Everything is so lovely!! So happy to join you on this tour. Love the transition! Where did you find the cloth owl and the lovely rooster?? 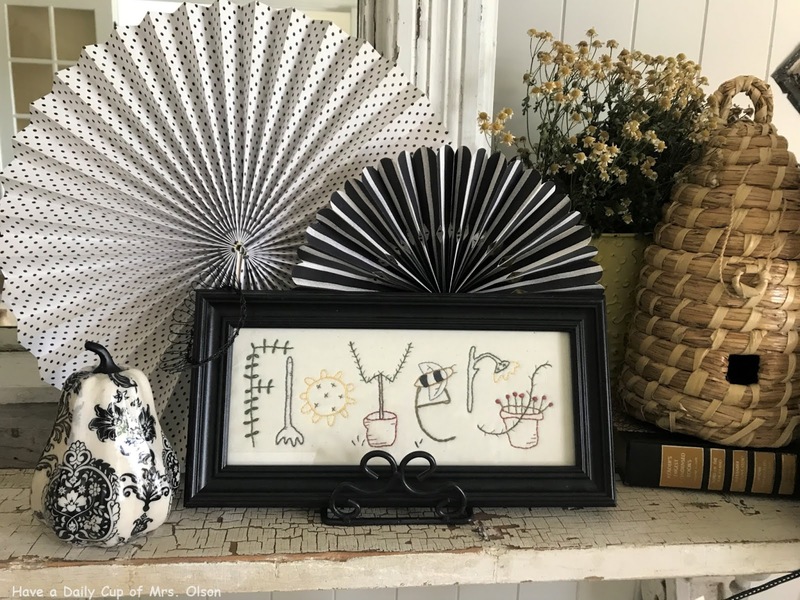 Jann, so many fun touches, you are always a girl after my own heart with your thrifted treasures and vignettes! Sunflower Sue is so adorable! 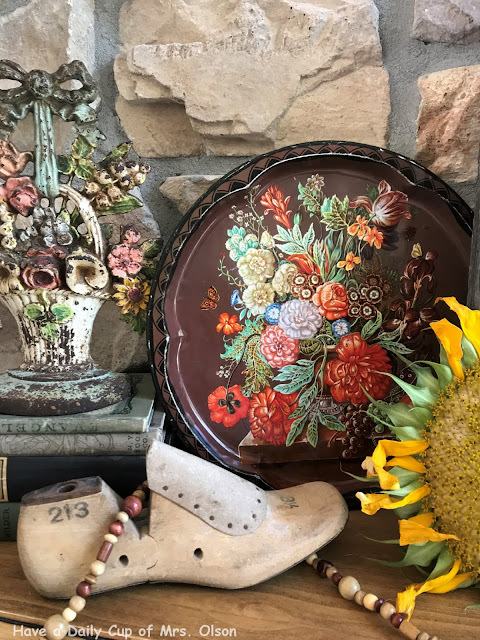 I love your dried sunflower heads, the vintage door stop and autumnal colored tray is divine! 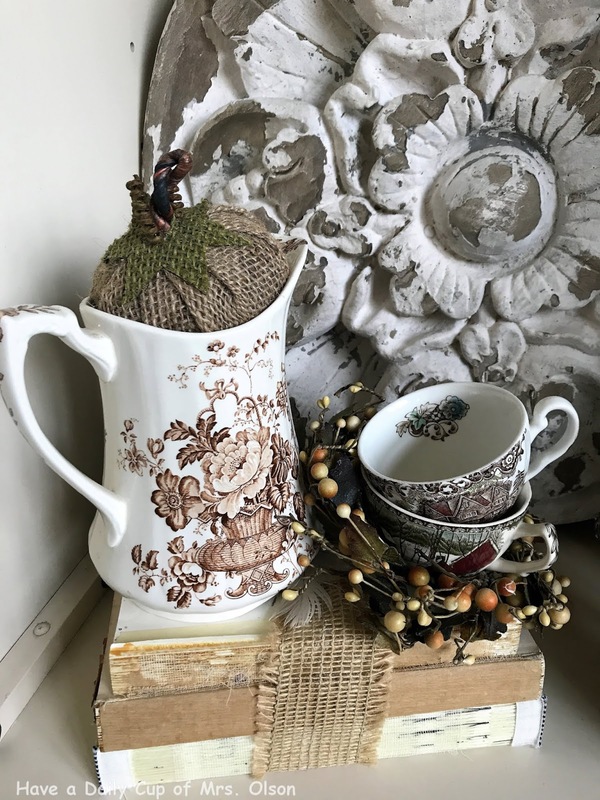 My favorite shot is the spent flowers in the transferware pitcher vignette, but there are so many things to love in this post. Your little heart flower wreath is so precious, and I love yarrow too! Thank you so much for joining this tour Jann, it is always fun hopping and touring with such a kindred spirit! I hope you enjoy the rest of summer and fall ahead!